1. In a large bowl or food container (able to hold at least 5-quart or 4.7L), mix the yeast, salt and honey in the lukewarm water (about 100 to 110°F or 37 to 43°C). 2. Add the olive oil and using a sturdy wooden spoon, mix in the remaining ingredients. Ensure that all dry ingredients are incorporated (if necessary, use wet hands to help incorporate the last bits of dry flour). 3. Cover (not airtight) the bowl or container and allow it to rest at room temperature until the dough rises and collapses (or flattens on top), about 2 hours. 4. The dough can be used immediately after the initial rise, though it is easier to handle when chilled. Store the dough covered (not airtight) in the refrigerator and use it within the next 10 days. Alternatively, store the dough for up to 3 weeks in the freezer in 1/2 lb portions. 5. To make a pizza, with flour-dusted hands and dusting the surface of the dough with a bit of all-purpose/plain flour, cut out about a 1/2 lb portion of the dough (approximately the size of an orange … use kitchen scissors or a serrated knife (like a steak knife) to cut the dough). Quickly stretch the skin of the dough from the top to bottom to make a ball (or just form it into a ball) and on a lightly-floured surface (I used baking parchment instead, which helped with carrying the pizza into and out of the oven), roll out or stretch the dough into a 12″ round (about 1/8 to 1/4″ thick), lightly dusting with additional all-purpose/plain flour if the dough feels too sticky. Top it with your choice of tomato-based sauce (or even a cream/cheese-based sauce), toppings and cheeses, but make sure not to lay too much of the toppings on the crust … I find not letting the toppings’ thickness exceed the thickness of the rolled out/stretched dough is a good guide of how much of the toppings you can lay on the crust. 6. Carefully place the pizza on a 450°C (230°C) preheated pizza stone or metal tray in the oven and bake for 8-10 minutes or until the cheese is nicely browned. 7. Remove the pizza from the oven, discard the baking parchment (if using), slice and serve it hot. The picture above the recipe shows my version of a Double Pepperoni and Cheese Pizza based on this dough, which has excellent pepperoni in between generous amounts of shredded mozzarella cheese and topped with freshly grated parmesan cheese, all on a base of Prego Traditional Italian Sauce sprinkled with a bit of ground oregano. At the last minute, I decided to add whatever leftover sliced black olives I had in the fridge onto the middle of the pizza … looks great, doesn’t it? Although the recipe makes ~12″ round pizzas, you can increase or decrease the size of your pizzas … to make smaller ones (e.g., “personal” pizzas that are 6″ wide) just use a smaller ball of dough. 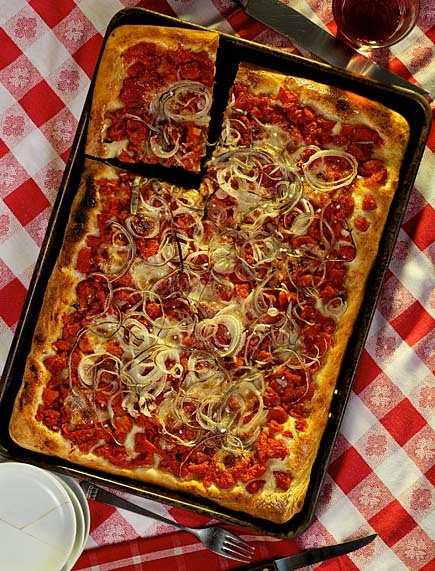 And if you want to make Sicilian-style pizzas (large, rectangular ones), roll out/stretch sufficient dough to fill a rectangular metal tray (or a tray of any size or shape) and top with your choice of toppings. You may need to increase or decrease the amount of baking time accordingly (increase the baking time for bigger pizzas or decrease the baking time for smaller pizzas … keep your eye on when the cheese nicely browns the first time you make the bigger/smaller pizzas, to determine how long to bake subsequent pizzas of the same size). Drop me a line if you decide to try this recipe … would love to hear how well it works for you!